Like the other branches of the military, the Navy adopted the jeep early on as a valuable 'Reconnaissance Car'. Certainly, many Navy jeeps filled the recon role, such as serving officers as transport vehicles or providing shore patrol units with offroad capabilities. 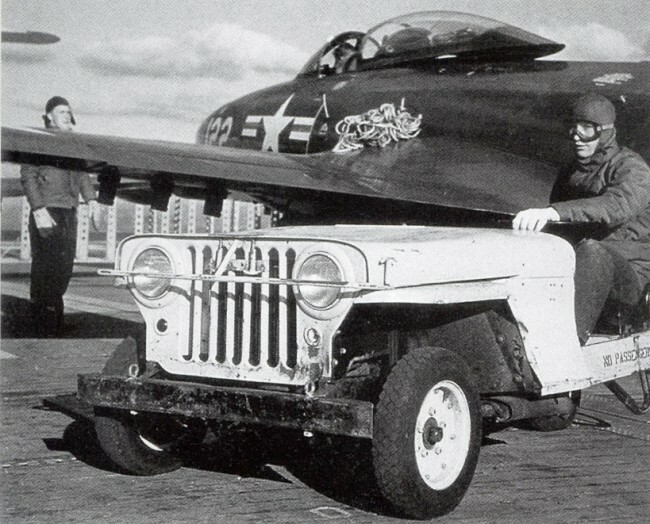 However, one particular application of the jeep was unique to the Navy: The use of jeeps as APU (Auxilary Power Units) on aircraft carriers. 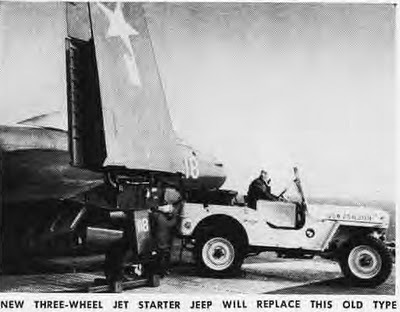 The jeep's first important role on Navy carriers was to tow planes (they were also referred to as a tractor or tugg). 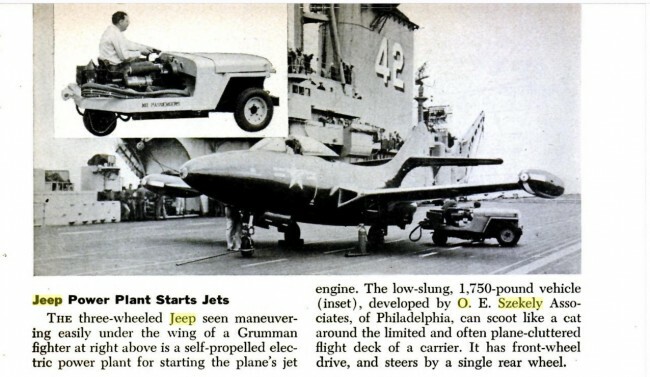 According to carrierbuilders.net, jeeps appeared on carriers in mid 1942. In part, this reflected the assignment of Grumman TBF Avengers, which were much heavier than earlier planes. 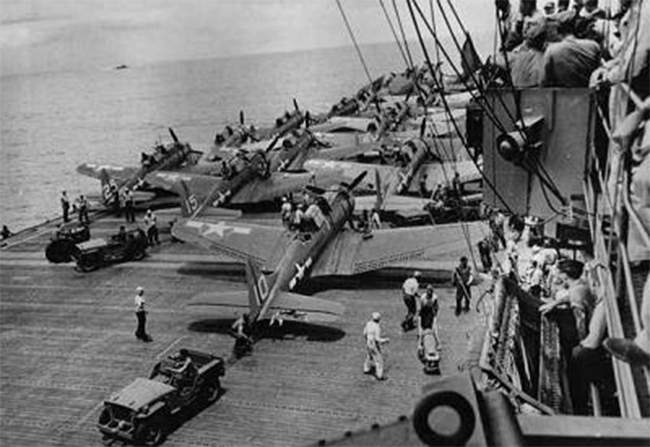 Thus, a tractor was needed to move the planes around the deck. The low range, compact design, and four wheel drive capabilities made jeeps useful for that purpose. Following the war, many jeeps were retired from naval carriers, but some lingered (how many is unknown). In 1949 the Navy welcomed their first jets, receiving 30 F6U Pirate fighters. They were a bit of a disaster in terms of performance, but one item they did require was an auxilary power unit for starting. Since there was already a few jeeps on board, someone had the idea to retrofit a standard WWII jeep into an APU vehicle. As you can see in the photo to the right from tailspintopics, this MB or GPW appears to have customizations in the passenger and cargo areas consistent with APU vehicles. For reasons as yet unknown, the O.E Szekely Company was awarded the contract to create custom APU jeeps. Szekely formed the company around 1919 when he left his role as chief engineer and production manager of the tractor department of Veli Motors Corp. At that time he took over the Gird-Iron-Grip Co, in Rock Island, Illinois, and changed its name to O.E Szekely Co. In 1923, the company was reorganized, with Szekely becoming chairman of the board and L.N. Burns becoming president and treasurer. While Szekely seemed to lean toward the automotive side, L.N. Burns specialized in the farm implement business. The O.E Szekely Company's history fades away until 1946 when an article in an SAE journal notes that "O.E. Szekely, after service for three and one-half years with the USNR, has returned to his former associates . . ." Given Szekely's service with the Naval Reserves, it's possible Szekely formed Navy connections that positioned the company to win the APU contract. However it worked out, the O.E. Szekely company won the contract to manufacture APU Jeeps, also known as Jet Starter Jeeps. Based on the evidence at hand (photo evidence that is), three known styles of 'jeeps' were modified and designed by the company. Each of these jeeps had a PTO that powered a generator capable of producing DC and in some cases AC. 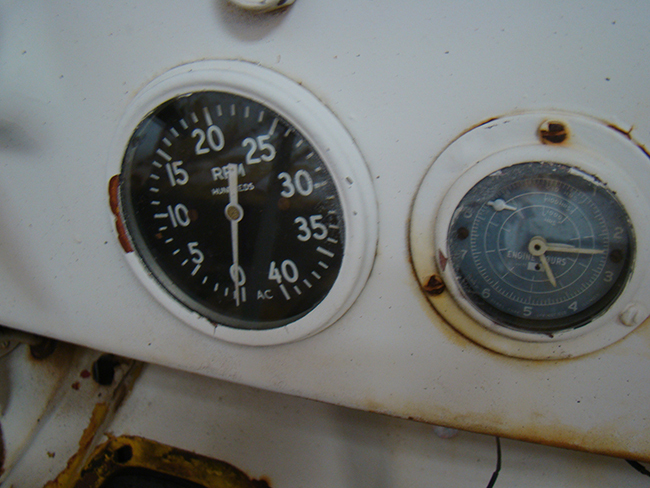 In addition, two extra gauges were added to the dashes of these vehicles: a running time gauge and a tachometer. The dashes of these jeeps should also have an O.E Szekely data plate, though it's a safe bet to assume not all Szekely jeeps have these anymore. At least one added change to the engine was made: a governor was installed to provide consistent engines speeds. While all the Szekely models appear to be based on the CJ-3A chassis, two of the biggest differentiators between the models are the a) use of three wheels vs. four wheels and b) the use of the l-head vs. the f-head. 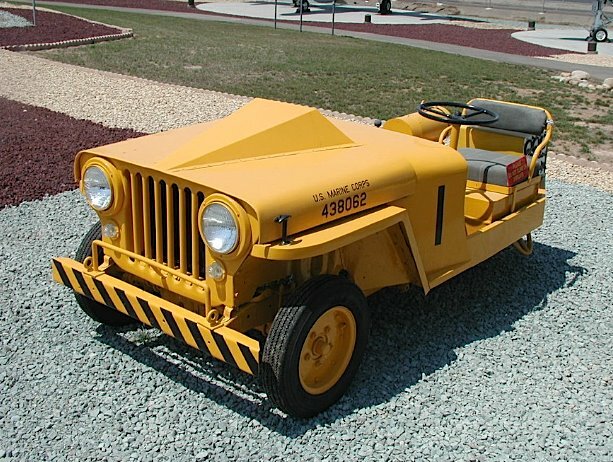 Thus far, no articles mention when the first Szekely f-head four wheeled jeep was delivered, but an early 1949 Aviation Week and Space Technology article suggested that the company was already at work developing a three-wheeled version of the APU. O.E. Szekely actually produced two types of APU jeep retrofits. The first, called the "B" type unit, was designed for aircraft servicing and produced only DC power (28 1/2 volts). The second, type "C" unit, produced DC and AC. Click here to see a late 1940s brochure produced by the company for the Willys Overland Equipment Book. While some of the APUs purchased by the Navy provided both AC and DC, there's no evidence that affirms all APUs sold to the Navy were the type "C" unit. Following the customization/production of the four and three-wheeled style APU jeeps, the company launched a new breed of starter vehicle. In 1951 they produced 292 Ford V-8 engine starter units that don't sound 'jeep-like' if this reference is correct. In 1959, the O.E. Szekely company was purchased by the George D. Roper Corporation. Given Roper made Willys Motors approved pumps, dozer blades and post hole diggers, this merger probably made sense. 1. Four wheel CJ-3A APU with an F-head. The triangular, raised hood bump is the most obvious sign of a Szekely jeep. The addition of the tach and usage time gauges are a big clue as well. In some cases, the custom data plate is still attached to the dash. 2. Three wheel CJ-3A APU with a L-head. The back end of these units have a tandem wheel setup (like the nose gear of an aircraft) in the middle that steers the vehicle. The front wheels are fixed and are only used to power it forward or backward. According to this website, instead of the transfer case shifting the vehicle into low range, it engages the generator. 3. Three wheel CJ-3A APU with a F-head (and hood bump). The APU pictured below is from the Miramar Marine Corps Air Museum in San Diego. This link shows a variety of three-wheel-APUs that were auctioned on eBay in 2010. Was there a 4th APU jeep? Could O.E. Szekely have created a fourth APU jeep using the stock CJ-3A with an L-head? There is plenty of documentation that the Navy purchased CJ-3As, but there seems to be no documented evidence to suggest any of these were Szekely APU jeeps. There are several questions that still need resolution. Any help with these issues would be great. Contact me at d@ewillys.com if you have answers, corrections or questions. When and how many vehicles did O.E. Szekely deliver (and how many of each type)? What were the specific model types? Some folks refer to the three wheeled version as the NC-1 or NC-1A, yet does that designation include both the l-head and f-head models? How many were built for the Navy vs. the Air Force? How many were placed at airports vs. on carriers? Was a stock CJ-3A APU L-head sold by O.E. Szekely? How many O.E. Szekely "B" and "C" units and/or Szekely APU jeeps were sold outside of the Navy or Airforce? Author David Eilers grew up in the Seattle area among jeeps and jeepers, camping and exploring the Pacific Northwest. 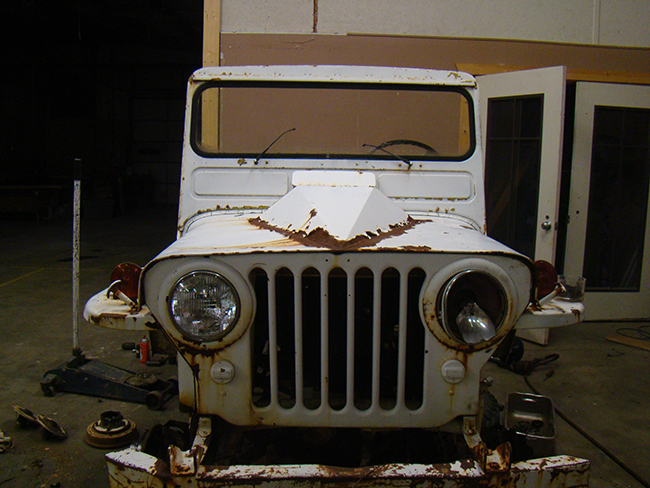 He's operated eWillys, a vintage jeep website, for more than six years. He's won awards for his jeep community efforts and toured the nation giving presentations. Learn more about him and read his latest book, The Amber Panels of Konigsberg.